Gable Barn is the barn that has a triangular shaped roof (shape of a letter A). The roof on the Gable Barn is built with a single slope on each side of the roof. Gable Barn's roof is often called a Gable Roof or an A-Frame Roof. The pitch of a Gable Roof usually varies between 4/12 (8.43° angle) - 12/12 (45° angle). 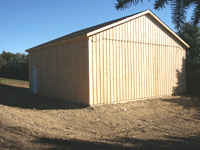 Depending on application and the barn design, a lower or a higher roof pitch may also be used. Barn shown on left has a 12/12 roof pitch. It is not recommended to build the roof with a pitch lower than 3/12 (14° angle) when shingles are used for the roofing material. In fact, some shingle manufacturer might not honor the warranty if roof is built with 3/12 or lower roof pitch. Ask your shingle supplier (or even better, call the manufacturer) to find out their minimum roof slope requirements. When metal is used as a roofing material, the roof pitch may be as low as 1/12 (4.76° angle), but if at all possible, keep the roof pitch at least 2/12 (9.46° angle). Don't forget to use the rubber mastic tape at the seam of each "screw down type" roof panel when roof slope is less than 3:12 pitch. Use mastic tape where your roof panels overlap each other for a better protection from water penetration. Again, to be on the safe side, ask your roofing supplier or the manufacturer of roof panels for their recommendations.